A scene from “Hedda Gabler” at the North Coast Repertory Theatre. “Hedda Gabler” is a tricky piece — tonally, theatrically and dramaturgically. The title character is enigmatic — part petulant child, part adolescent flirt, part evil manipulator. Hedda would rather hold someone else’s life in her hands than be controlled in any way (the playwright, Henrik Ibsen, called her desire to influence other people “demonic”). Hedda is a fantasist with no realistic concept of life or the consequences of her acts. Hedda is intrigued by men who live lives of choice and independence. Refusing to look at anything serious or unattractive, she wants everything to be beautiful. In her perverse world-view, she even sees beauty in ending one’s life — if it’s done “right.” She’s smart, fiery and elegant, but also nihilistic and cruel. She lives in a buttoned-down era that offers minimal opportunities for women beyond matrimony and procreation. She feels trapped — by her new marriage, her reduced social position and her confining society. She has a desire for freedom and a lust for power. On a whim, she is capable of destroying a life. She’s an anti-hero, who can be portrayed as admirable or despicable. 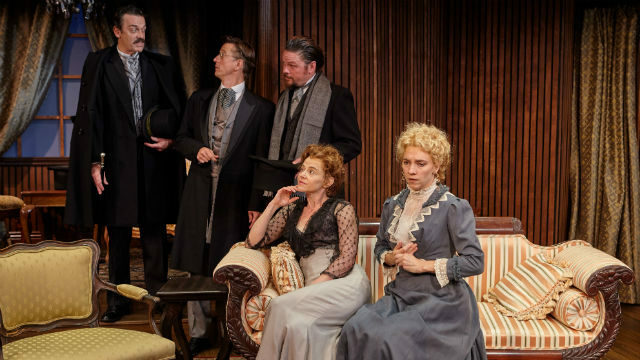 North Coast Repertory Theatre is presenting a lively, colloquial new translation of Ibsen’s 1891 classic, by Swedish-born local academic and dramatist Anne-Charlotte Hanes Harvey. Under David Ellenstein’s direction, this drama, often viewed as a tragedy, is played for comedy, which undermines the gravity and gravitas of the work. Although the acting styles vary considerably, several performers seem to be in a melodrama. This is particularly true of Mhari Sandoval as Hedda. Her moves, words and actions are indicated and exaggerated. She mugs for the audience and grimaces when other performers turn their backs or leave the stage. Bruce Turk is more energetic and amiable than many other, more stodgy Tesmans, Hedda’s pathetically clueless and unimaginative husband. Ray Chambers is deliciously oily (and occasionally ‘moustache-twirling’) as the amoral and nefarious Judge Brack, a friend of the family who tries to blackmail Hedda into a romantic triangle. Richard Baird, the most serious-minded in the cast, is compelling as Eilert Lövborg, the dissipated man of true vision, talent and passion. Rhona Gold gives a little bite to the housekeeper, while the other two performers register less formidably, as Tesman’s doting aunt (Cristina Soria) and Eilert’s muse and Hedda’s rival (Mel House). Hedda Gabler is one of the most coveted female roles in the dramatic canon. This classic of 19th century realism is a massive power-play. Every character, overtly or covertly, is craving a modicum of control But here, there’s minimal subtlety or nuance in the characterizations. So when the shocking conclusion comes, we’re less invested than we should be (especially if, like many audience members, we’ve been laughing regularly throughout the proceedings). The set (Marty Burnett) and costumes (Elisa Benzoni) are quite attractive, and the lighting (Matt Novotny) and sound (Melanie Chen) are effective. But this play should deliver a deeper, more enriching and fulfilling dramatic experience. Performances are Wednesday at 7 p.m., Thursday-Saturday at 8 p.m., Saturday and Sunday at 2 p.m.; Sunday at 7 p.m.